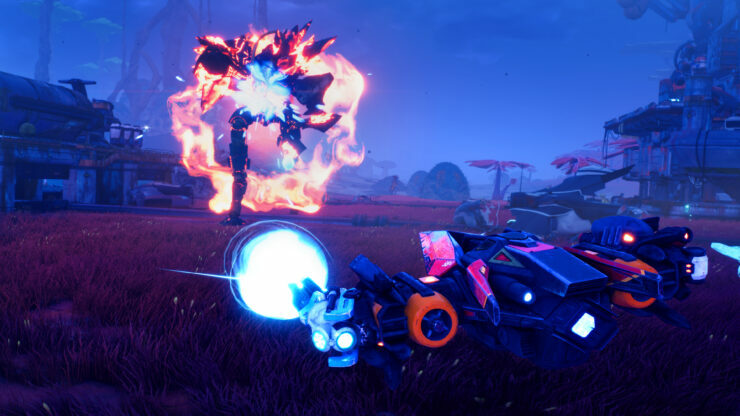 Starlink: Battle for Atlas is the newest and perhaps only toys-to-life game of 2018. Playing it at this years’ Gamescom, I had a chance to experiment with and examine the physical toys, as well as the game, for around two hours. Before starting you have to select a pilot, a ship and the ship’s loadout. Each one slots onto the controller’s mounting interface with a satisfying click and thud. The toys, even the thinnest of pilots, feels impressively solid and weighty. While I pity anyone who accidentally stands on an errant missile launcher, I’m happy to report these toys won’t be too easily broken. Once you’ve got all the pieces connected it does add a nice amount of weight to the controller, constantly reminding you of its physical presence. And as well as actual game-changing stats, which I’ll get into later, the ships are all unique looking toys, each with a distinctive design and colour scheme. When I was finally done assembling my warcraft, the game began. I didn’t get to play the very beginning of the game, but it was close enough. In typical child-friendly fashion, the main narrative thread is easy to understand, with stereotypically evil villains and heroic good guys. Star Fox and his merry band of fighter pilots all just sort of turn up towards the beginning of the adventure, and continue to hang out because they can. My first combat experience in Starlink was an outer space encounter with evil monks or pirates or both. While the controls were intuitive, I found this portion of the game a little hard to enjoy. With several enemies ships darting above and below me I struggled to hone in on an enemy with getting shot in the back. Although fairly forgiving, I got a little frustrated at only doing surface damage before having to wheel around in smaller and smaller circles to avoid fire. But after that and a couple more cutscenes introducing the bad guys, I was let loose on the solar system and the planets. I had a lot of fun on the planets. Swishing around a planet’s surface was great fun, launching up off hills and strafing around the various enemies was delightful. And there felt like a lot more to do here than out amongst the stars. One of my favourite side activities was scanning animals. These huge wandering creatures had to be encircled in order to be scanned, which often meant chasing them down and drifting in front of them when they tried to run. It was also planetside where I could feel the biggest difference between the ships. While some are balanced, others are exclusively built for speed or endurance. None have more than two weapon slots, but the ships do change the way you come into a fight. This comes into play even more since the ships also determine how many lives you have. Should one ship be destroyed, you’ll have to unplug the toy and continue the fight in another. Swapping from a tank to a flanker means quickly adapting for the fight. It’s a good idea, but perhaps one that children might not fully understand. Darting around the planet, and jumping across to a few other ones was great fun. Watching the story progress and the characters all interact with each other was nice too, and meant I could quickly swap out to play as my favourite one and swear never to use the annoying young human boy. Swapping the weapons was also a lot of fun. The game would helpfully hint at what weapons work on what enemies, but it’s your choice if you want to play your way. And the weapons all felt entirely different, even when doing roughly the same thing. Some weapons sent out vortexes that damaged enemies and could be augmented with elemental powers if you shot them with your other weapon. On top of that, each weapon acted as either flamethrowers, shotguns, missiles or even railguns. The journey towards the boss and the end of my time with Starlink was perhaps the most disappointing portion of my session. Throwing down not one, not two but three spires was repetitive and underwhelming. I was worried going into the boss fight that the original ideas had already dried up, but the fight itself was wonderful. The creature was huge, with smaller regular enemies spawning around it. While nothing completely mind-blowing, the fight had me boosting around and launching attacks at weak points before dashing away again. The boss fight also included clashes with the smaller foes while I had to watch out for the boss to launch its huge attacks in the background. I think Starlink could be a tremendous success. And I wouldn’t be nearly as worried for it if it had come out a few years ago. While it has next to no competition at the minute, it also doesn’t have much of a market. Skylanders, Lego Dimensions and all the others quietly sank under the weight of their price and no one seemed too upset. 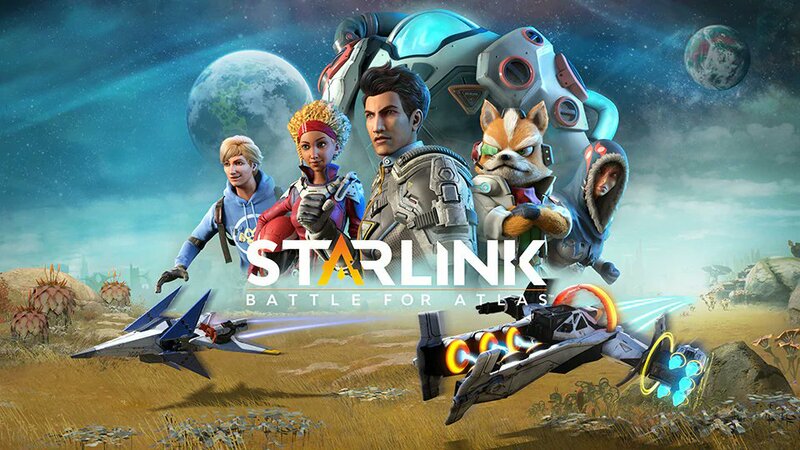 The Star Fox name will surely bring in some fans, at least for the Nintendo Switch version, and personally I really enjoyed my time with Starlink. Whether Ubisoft Toronto’s game can reignite the genre is a wholly different matter, though. We’ll know soon enough, with the game due to be available on October 16th for PlayStation 4, Xbox One and Nintendo Switch.